There is nothing more iconic in Seattle than the Space Needle and we think this should be a stop on your visit to the city. Built for the 1962 Worlds Fair, Seattle’s iconic “Needle” is more than just an icon, but a centerpiece of Seattle. Seen by its builders as an Eiffel Tower for the 21st century, the Eiffel Tower was a role model for the building of the Needle and is the only world tower that has come close to matching its legacy as a centerpiece and symbol of a city. In fact, the Eiffel flew out their entire kitchen crew to prepare the Needle’s first dinner and reaching into their cellar, they christened the Needle with French champagne when it opened. In 1959, artist Edward E. Carlson was inspired by the Stuttgart Tower in Germany and was sketching his vision of futuristic structure for the 1962 Seattle World’s Fair which had a century 21 theme. He created his initial design on a placemat in a coffee house. Edwards original design underwent several revisions by architect John Graham Jr. before it became the internationally known symbol we see today. The property where the Space Needle sits was secured for $75,000 to eliminate the possibility of lawsuits stopping the project as it would reside on private property and not public. To get a sense of how high the Space Needle should be before it was built, a helicopter was chartered and to determine the best height. The sweet spot was between 500-600 feet. Making it too tall would have made the surrounding city look too small and they were close enough to the ground so people could also see the bustling city below. The foundation for the Needle is 30 feet deep and 120 feet across and it took a total of 467 cement trucks to fill the hole. To make it the strongest, the pour was done all in one day and took 12 hours to deliver the 5,600 tons of concrete. When they were digging the foundation, workers found a Mastodon molar and an old horseshoe that was probably left over from the old fire station at the same location years before. As a symbol of good luck, the horseshoe was nailed above the construction shack entrance. Over 5,850 tons of concrete and steel were used to build it and it was built to withstand a wind velocity of 200 miles per hour. The Space Needle is held together by 74,000 large bolts. The union Iron Workers made $3.92 per hour to build the needle. The trip to the top of the Space Needle was $1.00 and one may have waited in line for 3 hours to go up in 1962. Today that wait is still not uncommon, especially during the busy tours season. The total cost to build the Needle was approximately $4.5 million. The show Frasier, which took place in Seattle and Frasier Crane had an amazing view of the city and Space Needle from Kerry Park wasn’t filmed there until the 101st episode. The original colors of the needle even took on a space-age focus at the worlds fair. The legs of the building were “Astronaut White,” the roof is “Galaxy Gold,” the halo is “Re-Entry Red” and the center is “Orbital Olive.” Galaxy gold was recently used again in 2012 to celebrate the 50 year anniversary of the Needle. The observation deck provides a 360-degree view of Seattle. The 200-seat revolving restaurant at the top is called SkyCity. The restaurant makes one full rotation every hour on a single 1.5 hp motor. Elevators on the Needle descend at 10 mph, the speed of a rain drop. The Space Needle is going through a $100 million remodel to take it into the next 50 years. Glass will replace the wire safety cage on the observation deck. • When the Space Needle was built in 1962, it was the tallest building west of the Mississippi River. • The center of gravity for the Space Needle is 5 feet above the ground. • The Space Needle is fastened to its foundation with 72 bolts, over 30 feet in length and 4 inches across. • The Space Needle sways approximately 1 inch for every 10 mph of wind. 25 lightning rods (24 actual rods, plus the tower) are on the roof of the Needle to withstand lightning strikes. • The restaurant turntable revolves on a track and wheel system that weighs roughly 125 tons, borrowed from railroad technology. All it takes to make the turntable revolve is a 1½ horsepower motor (originally it was a 1 hp motor). • The Space Needle elevators weigh 14,000 pounds each with a capacity of 4,500 pounds. The counter-weight weighs 40 percent more than the elevator fully loaded. • Each elevator has seven cables total, even though one cable is strong enough to hold the entire weight of the elevator. • The elevators that travel 10 mph are equal to the speed in which a raindrop falls to earth. In fact, a snowflake falls at 3 mph, so in an elevator during a snowstorm, it appears to be snowing upwards. • The last elevator arrived the day before the 1962 World’s Fair opened. • The first Space Needle Manager, Hoge Sullivan, had acrophobia, a fear of heights. • Renowned astronaut, Buzz Aldrin, was on hand to present the winner of the Space Race celebrating the Space Needle’s 50th Anniversary with the grand prize – a sub-orbital trip into space. 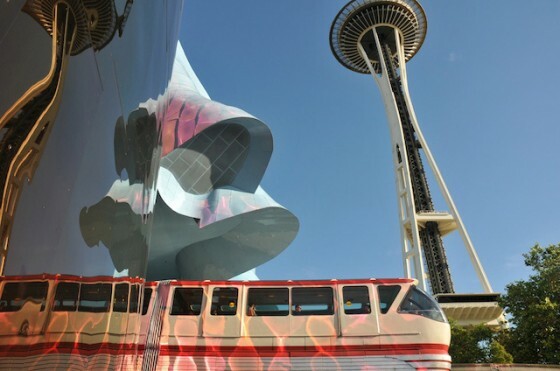 This entry was posted in Travel and tagged How tall is the space needle, restaurant, Seattle Space Needle, space needle, space needle facts, tickets. Bookmark the permalink.